On Saturday, two previous participants from the Northrop Grumman Lunar Lander X PRIZE Challenge flew their vehicles at the Friends of Amateur Rocketry site (Cantil, CA). 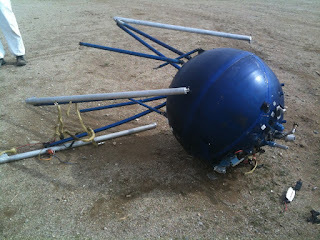 Following Masten's flight, Unreasonable Rocket performed a tether test with their Blue Ball vehicle. The test was successful, with systems checking out and demonstrated vehicle control. The decision was made to attempt a free flight with the same vehicle. Not long into the flight, control was lost and the vehicle began to drift, so the flight was manually aborted and the vehicle fell (un-powered) to the ground, causing extensive damage. Regardless of the outcomes of these flights, it is very encouraging to see companies and teams that participated in the NGLLXPC continuing to work on their vehicles, and attempting flights that demonstrate their ambition and ever-expanding capabilities.